Native plants are the best way to provide food for wild birds, that is one of the most effective way to attract birds in a natural way to your yard, the plants give them natiral habitat and the birds feel at home there. However, bird feeders are good way to give birds another food source, and supplement its diet. It is also a great way to watch them up close.. There are lots of feeders out there, so consider what bird species you want in your back yard. Different bird seed, and feeders will atrract different tyoe of birds. It is good to make some experiment, but you can try different feeders around your yard. 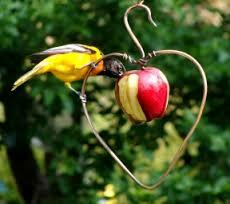 Types of bird Feeders: There are lots of feeders available. Non-selective types are used by large variety of birds, others design are attracting smaller more specific birds. 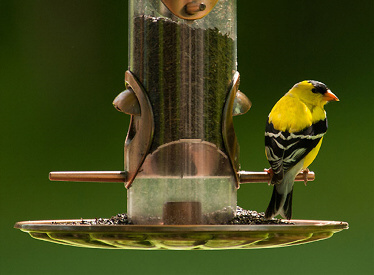 For the birders who want more diversity in the backyard, it is best to install more than one type of feeder. Tube Feeders: The benefit of these feeders is variety of different seed. It is made of a tube like cylinder that is hollow, it can be made from plastic or glass, so that we can see the seed clearly, and designed with multiple feeding ports and bird perches. There are metal feeders that are more expensive but are less damaged by squirrles. Most tube feeders have perches located below the line of feeding ports. These perches are designed short, for smaller birds like chickadees, titmice, wrens, and finches. Some birds feed hanging upside down, so feeders can have perches above feeding points. Hopper feeders: These are larger feeders, and come in many creative designs, but the most popular is a house design with clear plastic sides in v shape. From these sides the sed falls down and it is eaten. These feeders can hold larger quantity od food, and are not to be reffiled so often. But squirrels like these feeders more. Hopper feeeders are good for all the same types of birds as tube feeders, but can feed larger birds also, like blue jays, cardinals, grosbeaks. 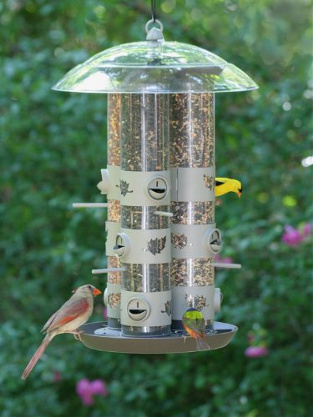 Most of the individuals buy these kind of feeders as the first one. Hoppers have roof, sides and a floor. All of the seed in in a bin, and is protected from the weather. The chales type is a hopper feeder, but i has four sides, and the gazebo being round, is made of one circular side. All have a hole in the bottom for the seed to fall out on the flour where the birds eat them. Usualy gazebo is very decorative type, and makes a backyard more aesthetic to the owner. But all of the hopper feeders are in practise very functional, and can can attract large variety of birds. Chickadees,Nuthatches, Red Bellied Woodpeckers,Cardinals,Finches,Grosbeaks,Titmouse,Jays,Pine Siskin,Buntings,Sparrows,Starlings,Blackbirds,Mourning Doves, . Platform feeder: These have a surface that is flat and raised, and is a platform for the fruit and seed. It can be with the roof, or not, the roof is a protection from the rain. It is important to keep all feeders in a clean state, but platform feeder must be goven extra care. In the studies this feeder is most prone to diseases from all of feeders types becouse bird dropings collect on the platform and can fall on the seed. If you can use the one that has mesh bottom, so the dropings do not stay on the feeder, and it will minimize the contamination. Platform feeder that hangs higher from the ground will be visited by the same birds that are guests at ather type of feeders. 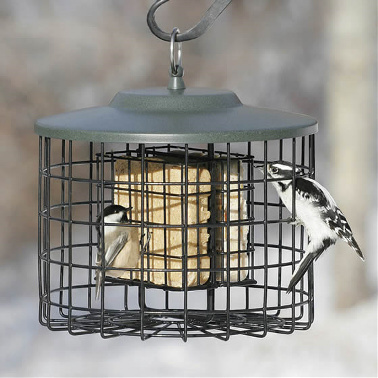 Suet feeder: This type of feeder is going to attract bids like woodpeckers, bluebirds, cardinals, chickadees, jays, nuthatches, titmice, and wrens, the design is simple, its a cage where the cake is located, and the birds will cling to it. Suet feeders are made for the birds that are natural clingers. Woodpecker like this type of feeer alot. Nyjer feeders: Nyjer si the seed that is filled in this feeder, this seed is favorite food of the American goldfinches, purple finches and pine siskins. But ather birds do nit like the this seed. There is two types of this feeder, first one is a standard tube like, and the second is a mesh bag, that looks like a sock. It will attract hanging birds. 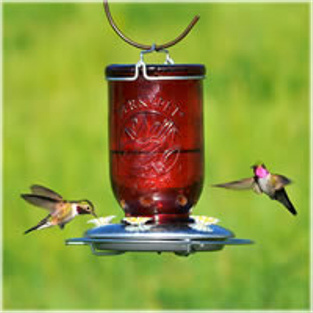 Nectar feeders: This feeders are primarly used and visited by hummingbirds. The nectar feeder mimic the flower, and its filled with nectar, or sugar water. lots of designs are on the market, but red is the favorite, since hummingbirds like red color. This feeders must be clean on regular basis, as the sugar can ferment, and can hurt the birds. The water in nectar feeders must be changer changed every 3 days to make sure mold and fermentation is not present. In direct sunlight, and in heat, this process is quicken. Hanging them on the shade will help and slow down this. The cleaning process is done with hot water and a brush, you can use a toot brush. Do not use soap or detergent, as it can contaminate the nectar when it is re-filled. Fruit feeders: These are design to hold fruit pieces, and come in a large mix and styles, birds like bluebirds, orioles, house finches love to feed on fruit, and will visit this feeders. Make sure that location of the feeder is in good view, so you can watch the birds at feeding. Wneh you are installing the feeder think about different birds that will visit the feeder and the food thay eat. to minimize crowding and attract larger diversity od birds, install more that one type of feeders. Hopper, tube, niger, suet, and raised platform feeders for the birds that feed above ground, and platform for groung feeding visitors. Window strike can be a issue so locate your feeder away from your house, if that it is not possible , research suggest to install it more closer than farther, some say about 3m from window. This way if the bird collide woth the window it will not strike that hard. If you place a feeder closer to your window birds cannot build up anough momentum when thay fly away to cause injury. Hanging decorations on the window will help to prevent it. . Birds that are feeder visitors like to have shrubs and trees near, so they can perch or hide, yhis is how birds feel safer from predators like cats, install feeders in this spots will attract birds more easily. 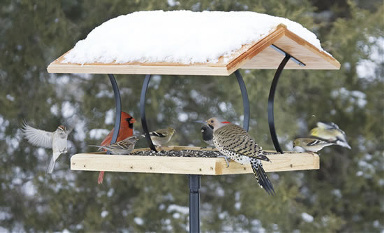 If there is space in your yard, try placing more than one feeder, this is effective in attracting a large flock of birds, some like to feed near vegettion, and other like more open spaces. This will aslo prevent aggresion from crowding, so this will minimize aggresive birds behavior.. Cleaning maintain a clean feeder is important in order to prevent disease. It is recommended to do it once every two weeks,for mold not to acumulate, bird droping can also be an isue. In hummid and wet weather the feeders can be clean even more regularly. You can use 10% bleach solution for ceramic, glas and plastic feeders, and dry them before filling them with seed. Wooden feedrs can be clean with soap water. You must also clean the ground under the feeder to prevent hulls from accumulating and bird droping. As this can attract rodent to the feeding station. Squirrels are a nuisance at many bird feeders. 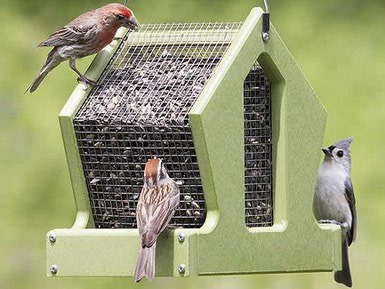 When selecting a feeder, look for one that has squirrel-proof features such as metal feeding ports and perching posts or that has a domed overhang to prevent squirrels from gaining access.They become a real problem when they take over a feeder, scaring away birds and tossing seed around. Squirrels are extremely agile and any bird feeder hanging from a tree is likely to become a squirrel feeder. They also have strong teeth and can chew easily through plastic and wooden feeders to get at their contents. You can also install your feeders on a pole with a baffle that prevents squirrels climbing up from the ground to access food. The pole, with attached feeders, should be located 10–15 feet away from tree trunks and overhanging limbs as squirrels are capable of jumping up to 10 feet and can easily reach it. If you store your supply of bird food outside, keep it in metal box so rodents cannot get to it. Squirrels can chew through containers made even from heavy plastic and spoil your stock. Prevent Mammals Keep all bird seed stored in tightly covered containers out of the elements. Avoid feeding old bread and other kitchen scraps, as these items attract starlings and crows. Do not encourage mammals like deer and raccoons to feed on corn, apples, etc. in your yard—these species can become regular visitirs and neighborhood nuisance. Avoid leaving cat food and dog food outside in your yard. And one other important reminder: Keep Cats Indoors! Cats are non-native predators, and will yearly kill millions of birds, small mammals, reptiles, and many other wildlife species. Cats should not be allowed to roam outside free to wreak such destruction. No Birds are visiting your feeders? Be patient: when you first place feeders in your yard, birds do not know it and may take some time for birds to find the new food source that you povided and start using the feeders. If no birds visit your new installed feeder within 1–2 weeks of setting it up, try sprinkling some seeds around the feeder on the ground to help them find it. If the birds still do not come, it may be that they are scared and uncomfortable with the feeder location. In these situations, moving feeders from that location to a new place can help. Including more bird-friendly native plants in your landscaping and garden can also draw birds, which will then use your feeders.